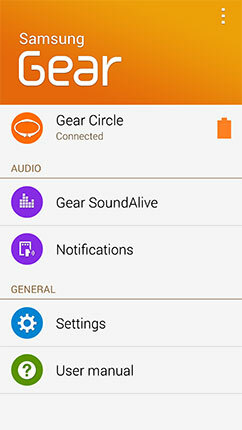 Gear Circle: How do I use S Voice™ on my Samsung Gear™ Circle? 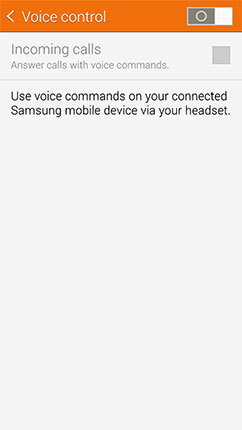 With the Samsung S Voice™ application, you can use your voice to perform operations with your Samsung Gear™ Circle that you would normally have to do by hand on your mobile device. 1. From the Home screen of your mobile device, touch Apps . 2. Touch Samsung Gear . 5. 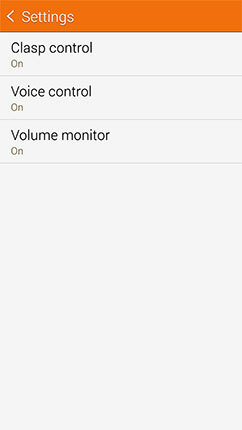 If necessary, touch the slider to turn Voice control on . 6. Mark the Incoming calls checkbox to answer calls on your connected mobile device using voice commands on your Gear Circle. 1. Press and hold the Play/Talk key on your Gear Circle for one second. 2. Say a voice command. 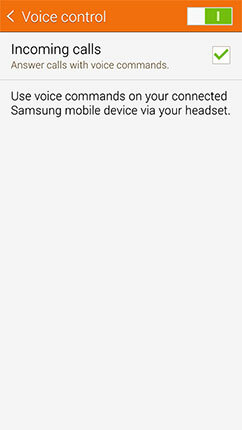 Note: You may need to set S Voice as your default voice control application. • "Text Katie message Are you free tonight for dinner?" • "Read message from James"
• "When is Michael's birthday?" • "What is Donna's address?" • "Check schedule on Friday"
• "Show my task for Friday"
• "Remind me to check email at 9 a.m."
• "New task Concert review due on May 18th"
• "Navigate to city hall"
• "Set alarm for 6 a.m."
• "Set alarm for 4 hours from now"
• "Wake me up at 6 a.m. tomorrow"
• "Set timer for 1 minute"
• "Create timer for 5 minutes"
• "What is the weather today?" • "Check the weather forecast"
• "Weather in New York"
• "What time is it?" • "What time is it in New York?" Warning: The Gear Circle contains magnets in its earbuds. The American Health Association (US) and the Medicines and Healthcare Products Regulatory Agency (UK) both warn that magnets can affect the operation of implanted pacemakers, cardioverters, defibrillators, insulin pumps, or other electro medical devices (collectively, "Medical Device") within the range of 15cm (6 inches). If you are a user of any of these Medical Devices, DO NOT USE THE GEAR CIRCLE UNLESS YOU HAVE CONSULTED WITH YOUR PHYSICIAN. How do I connect my Gear Circle with another device using the Gear application? Gear Manager: How can I connect my Gear device to iOS mobile device?